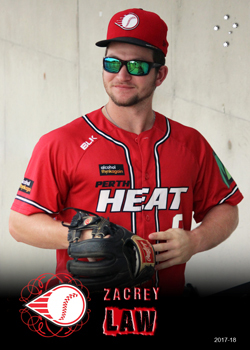 Zac Law is an American import from the Tampa Bay Rays organisation who played with the Perth Heat during the 2017-18 ABL season. Law spent 2017 playing for the low A level Hudson Valley Renegades in the New York Pennsylvania League. Law went home part way during the season to get married ... that's an unusual reason to end up cutting your season short.